Rocketfire your online marketing with moreviews.net. A special program for Social media marketing, Facebook, YouTube and Twitter marketing. The success of every website now depends on social media visibility. If a blog or website has many social media followers than surely it is going to get success. More followers means more unique page views and traffic. Even after Google updates, one thing is clear that if you want search engine results then increase your social media visibility. That is commonly known as online marketing. I have seen many websites performing well in search engine results just because of their strong social media presence not because of backlinks. So even search engine admires your social media popularity. Edomz review and my 15$ earning till today with proof. Edomz provide higher CPM rate. Check yourself. Today's post is for those people who want to monetize their website with pop up ads. You can earn handsome amount of money if you have good traffic. One of my blog known as Bestofshayari receives more than 15,000 pageviews in a day. I am earning good money with Adsense, but I wanted to earn more so I decided to monetize it with edomz and the results are pretty good. Edomz claims that it provides higher CPM rate. So I decided to join this network and I am happy with the earnings. Below I will share my earnings and traffic status so that you can also join edomz and earn good money with your traffic. Blogger template performance when compared to popular blogs. 7 issues that you need to know to better optimize your template for getting search engine results. On page optimization, Off page optimization and SEO are very important for the website growth but apart from this you also need to see is your blogger template is also optimized or not. So today I checked my blogger template with top 3 blogs about which everyone knows. I wanted to see how my blog performs when compared to these popular blogs. So I will share everything with you about blogger template performance and what I and you should learn. I am checking my blogger template with these popular blogs. How Popular Blogger Like Darren Rowse, Neil Patel, Ileane Smith and other persuade visitors to write comments on their blog post. A game of words played by popular bloggers to get more comments. Today we will show you why Darren Rowse, Neil Patel, Ileane Smith and many others gets more than 100 comments for a single blog post and what are their ideas to persuade their visitors. Every blogger wants to see more comments in their blog post but many of them fail to interact with their visitors which results into very few comments or even nil. But when we see other bloggers like Neil Patel of quicksprout.com, Darren Rowse of problogger.net, Ileane smith of basicblogtips.com and Mohammad of mybloggertricks.com then we surprise what extra they do and what is their magic formula for getting large number of comments for their post. So in this article we will try to know what they do so that they receive more than 100 comments for each post and how they interact with their visitors. It is all game of words that they use but the question is what are those words. And this is the only basic difference between them and us. If we could resolve then you can also get a large number of comments for each post. But remember this is not the only reason they are getting comments but some other reasons as well and that is their pure and rich content. So write quality posts and use their formula to encourage comments and the result will be getting comments. So we made a research on the top bloggers blog. With few codes you will know how to optimize your blogger template for SEO by our template doctor guide. Content is king everyone knows that but only this does not make you eligible to receive search engine results. There are , many other things like on page optimization and SEO which makes your website or blog eligible for better performance. So today to achieve this we are going to optimize blogger template with a few codes that you can add to your blogger template and make it optimized for getting search engine results. It is a template doctor guide for how to optimize blogger template for SEO. We will discuss on all the issue that can make your blogger template search engine friendly and SEO optimized so that your blog appears in search engine results. We will discuss on following points to optimize your blogger template. Keywords in blog title and description. How to optimize email subscription box to increase more readers for your blogger blog. Here we have 5 great ideas to do this. A blog is known by the reader it has. So to increases the blog readers, First thing that you have to do is optimize your email subscription box. It must convince and impress users so that they subscribe to your blog. Most of the people like me does not know how doing that so I decided to read master blog. Master means which have lists of subscribers and their most of the traffic from those lists. So the question is how they did it and what makes them different from us. So today we will visit all those blogs which I consider master and figure out what is hidden in their email subscription box and why they are so successful when it comes about the number of subscribers. Their writing tips have always been beneficial for me. NOTE : - Email subscription box itself is not the only reason for their long list of followers but also their content, on page optimization, Backlinks and Search engine friendly template. They always share new and different ideas which increase their visibility on social media through sharing. Yeah party time. Google page rank update 2013. And google rewarded my website with PR 2. Thanks for your blessings. Finally the wait is over and google page rank has been updated. It has come after a long time as we know current month is December and my website is only 8 moths old. And the good thing is google rewarded avdhootblogger.com with PR 2. I am so happy that my blog got this PR 2. Everyone was thinking that it will come in 2014 but as we know google always surprises so it has come in December and gave this year a good ending. And many of my other blogs also got PR1. So i am quite happy with the performance of my website. Top 5 blogger blogs and their font style with css code for you. Text style like Problogger, mybloggertricks, shoutmeloud, basicblogtips and blogging tips. I am a regular visitor of these 5 blogs and take seriously whatever they mention. And I want to reach up to that level where they are today. Either it is traffic, Money or readership and loyalty, They are all perfect and very successful. So i thought what if it will take time for us to reach up to that level but when it comes about design and typography that they use then at least we can take inspiration from them. So for that purpose I am sharing their font style with css code so that you can copy the code and have the same font style like mybloggertricks, Problogger, shoutmeloud, basicblogtips and blogging tips. If you are familiar with blogger template editing then you can easily replace your default font style with these. And believe me if they are using these font styles then for sure there is something hidden in it. And they are successful too. So follow the successful persons and one day you will be like them. So below are the font style css code that you can copy and paste in your template to match with the successful blog's font style. My blogger tricks is run and managed by Mohammad Mustafa Ahmedzai. Using blogger as a platform and is an idol for many of bloggers like me. He shares blogger tips and blogger widgets. Shoutmeloud is run and maintained by Harsh Agrawal. He is an Indian and ideal for many newbie bloggers like me. He got success from his blog in terms of making money and readership. His writing skills are excellent and everyone gets lost in reading his posts. He worked hard and today a successful person. So this were the top 5 bloggers blog named as basicblogtips, problogger, mybloggertricks, bloggingtips and shoutmelous. You can have the same fonts like their blog. Copy the css code and paste it and you are done. Yes here I will show you how I got 3% traffic growth from Tumblr tags. Tumblr is a great way to drive referral traffic and to find targeted audience. 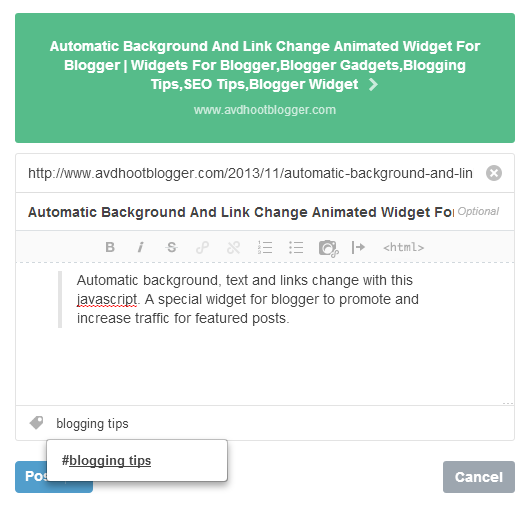 The targeted audience is the best way to get benefit from Tumblr tags and most importantly how you use social media. It is very clear that social media nowadays are the best way to drive traffic to your blog and one of them is tumblr. If you use Tumblr in a different way it can be very beneficial for you when it is about traffic. However I use Tumblr and I have found 3% traffic growth in my overall traffic. So today i will show you how to drive traffic to your website or blog through Tumblr. And what is the secret formula for using Tumblr for traffic. We will include use of tumblr tags and find targeted audience. Targeted audience means people related to your niche and share their ideas. I am interested in blogging tips, tricks and widgets. So i found my targeted audience and i will show you today how you can also do it and drive traffic for your blogs.